DD5LP/P – December 18th. 2016 – DM/BM-135 Hesselberg & DM/BM-226 Dürrenberg. After a while not activating and with no snow to speak of on the ground I decided to make another activation. While the lifts to the DL summits are all stopped for maintenance before the start of the Skiing season at Christmas, I looked to the DM region, with their easier to access summits with higher point values. The problem for me is the distance, especially after the last purge of nonconforming summits in the DM region, the closest for me are around 2 hours drive away. 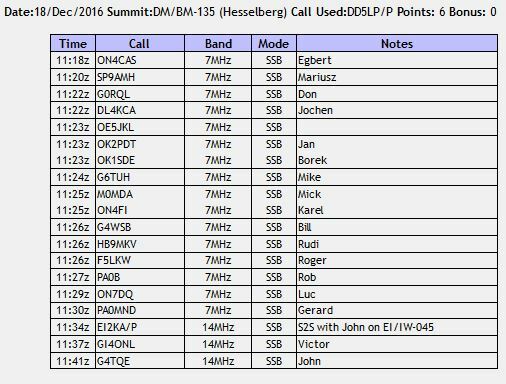 Looking through some of the closer summits, I had activated Dürrenberg before but as that was back in 2014, I would get 6 points for an activation in 2016. This would still be a 2 hour plus drive, so I looked to see if I could possibly include another summit en-route to make the trip worth-while and found Hesselberg. A summit that appeared to have really easy access and again would give me 6 points. Neither of these summits have winter bonus points. For these activations I would not be testing out any new antennas, rather relying on the old faithful SOTABeams linked dipole and the Lambdahalbe 6 metre squid pole. As I now always re-charge and re-pack all equipment when I get back from an activation, I only needed to check my two bags to see what was in them and remove what was not needed. I would add my pack-up the following day and then set off at about 10am hoping to be back by 4pm. Both Summits lie north of Augsburg in the direction of Ulm and are around a 2hr. drive north from my home QTH. I decided to go to Hesselberg first as I had not yet activated that summit and it “seemed” to be easy to get to. Using the NAVI to find the shortest route about 40% of the route was on Autobahn or large roads and 60% on small country back-roads. Since I have loaded in all SOTA summits in Germany into my car navigator I planned to simply follow its directions. I did, however also print out the Google Maps routes to and between each summit, in case I lost GPS coverage as happened on the last outing. The weather over the previous week had been cold but sunny with morning fog clearing around 9am. This day was no different and I set off at the planned 10am. The further north I drove however, the darker the skies got and once past Augsburg, it was obvious that the weather was not going to be sunny. In fact quite the opposite, I had rain, mist and generally grey weather all the way to the first summit, Hesselberg, which after about 2.5 hours driving was sat in low clouds as you will see from the slide show below. There was actually snow on the ground in the car park. However this IS an easy access summit, also suitable for people with disabilities. The track up to the summit from the car park is about 60 metres (although the sign says 100m). On the summit there is a solid wooden picnic table with benches and the information panels make good supports for the squid pole mast. There is also a TV transmitter tower on this summit but although it couldn’t be more than 50 metres away, I could only see parts of it through the clouds. I am sure the views from this summit are normally fantastic but on this day it was simply a wall of white in all directions! I had planned to activate on both 40 metres and 20 metres however 40 metres was the best band for propagation. It was impossible to find a completely free frequency and I ended up on a frequency where two russian speaking stations were having a local chat. Despite that (and I’m sure I didn’t disturb them with my lowly 30 watts and a dipole) I managed a good run of 16 contacts around Europe and then finished off with an S2S with John EI2KA/P and two other UK contacts on 20 metres before deciding to pack up. When I took the antenna down ice had formed all the way along the thin wire. No wonder I was also feeling cold and welcomed the fact that it was less than 5 minutes to get back to the car in the car park. The journey from Hesselberg to Dürrenberg took longer than expected, partly due to the weather (which hadn’t improved) and partially due to road works requiring a slight change of route. I did however eventually get to the same place that I parked the last time that I had activated the summit, unpacked my gear from the park and started the 15 minute slog up the road (which is closed off with a locked barrier as this used to be a military installation). It was good that I knew the route as that low cloud / fog was still there and I could not see the summit from the bottom of the road. Visibility was probably down to 3 metres in some parts of the walk up the hill. 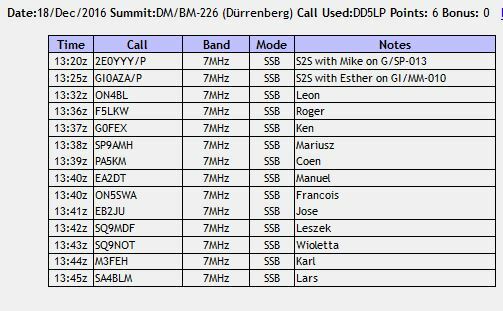 Dürrenberg is a wooden summit, which is generally bad from a radio point of view and also finding support for the mast to carry the Inverted-V dipole, however I already knew what I was going to do. The underground parts of this installation had air vent pipes coming out of the ground in the woods and these are perfect for attaching the 6m squiddy to with my rubber straps. At this time, I started to think it was not as cold on Dürrenberg as on Hesselberg however I was wrong and by the time I finished the activation, I could feel the effects of Hypothermia, having difficulty concentrating and being slow at doing things. On checking spots I could see the majority of activity was on 40 metres rather than 20 metres so I started there with two S2S contacts right away – one with Mike 2E0YYY on Gun and another with Esther GIOAZA over in Northern Ireland. The band was not nearly as busy as it had been on Hesselberg so it was easy to find a free frequency and I put out a CQ to receive a flow of 12 chasers from all around Europe in the next 15 minutes. There was no sign of the VK6 S2S that Mike and I had hoped to catch via short path unfortunately and 10 minutes of calling CQ on 20 metres brought no responses at all – that band had completely closed. By this time I was behind schedule for my return journey it was dark and I was feeling the cold now, so I packed up and returned to the car. the route home was quite different to the one I had used to drive to the area but after 2.5 hours driving (which seemed a lot longer), I arrived home at 5:30pm, glad to be safely home. 6 metre portable squid pole. “Spy Glasses” for video recording (not used in the cold). I need to consider the dangers of activating in the cold and wet. Hypothermia is a real danger as it driving a long distance when tired. This entry was posted in SOTA and tagged Dürrenberg, DM/BM-135, DM/BM-226, Hesselberg, SOTA by VK2JI DD5LP G8GLM. Bookmark the permalink.